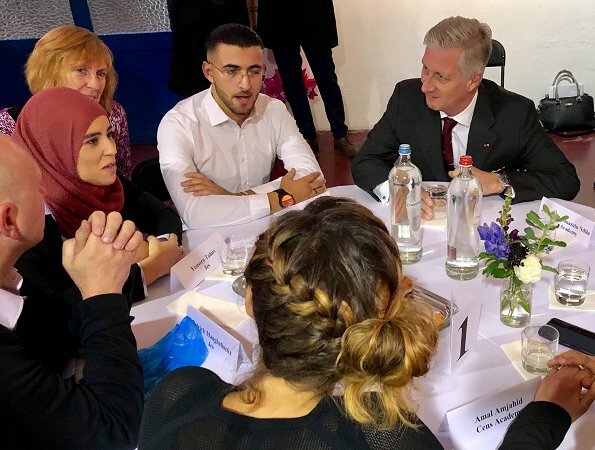 On the second day of their State visit to Belgium, French President Emmanuel Macron and First Lady Brigitte Macron visited Sint-Jans-Molenbeek city together with King Philippe and Queen Mathilde and attended a series of events there. 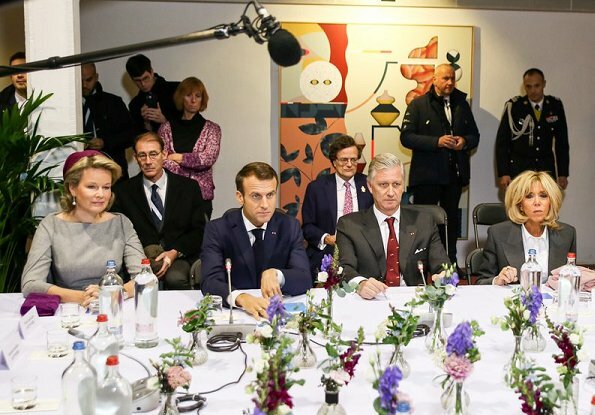 King Philippe and Queen Mathilde of Belgium, President Emmanuel Macron and Brigitte Macron attended a meeting at LaVallee Cultural Center. 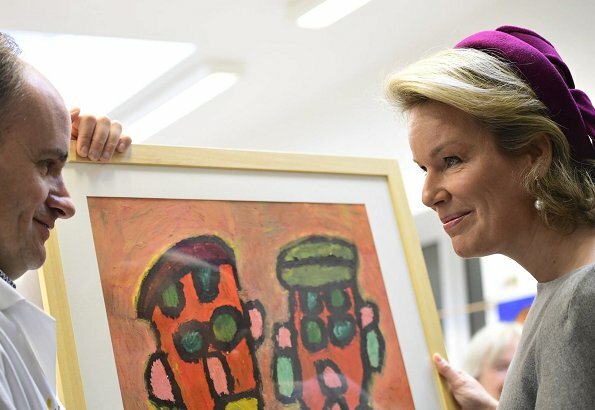 Queen Mathilde and Brigitte Macron visited La Maisonnee care center which provides service for people with mental disabilities and then visited Louvain-La-Neuve University. 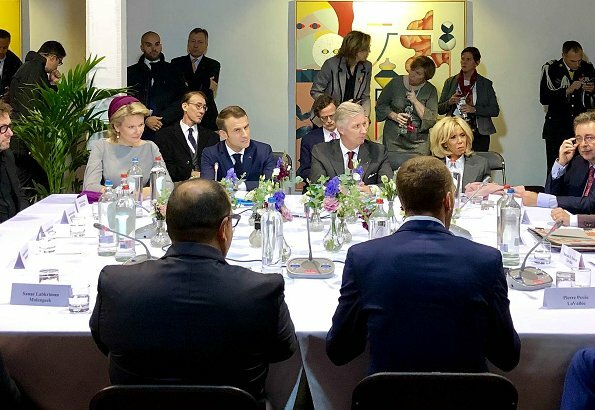 In my view Mathilde is a bit overdressed for the event, I prefer the business style of Brigitte M.
I do not think the event called for a hat. Mme. 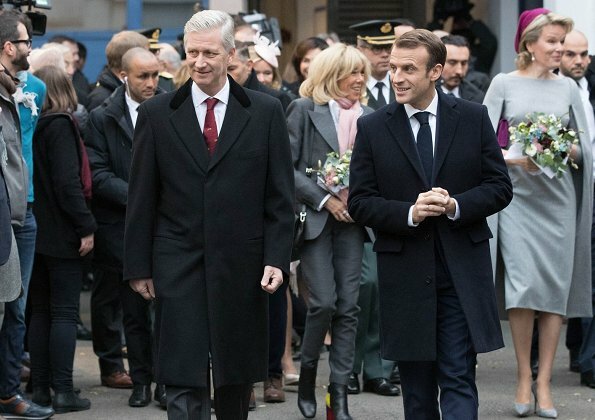 Macron is getting better in her choice of clothing but her hair style is not appropriate for her age. Two chic women..... one in a Royal way and the other in a cool, ageless, rather French way. And, the president looks so so so handsome, a good looking guy for sure. Anonymous (7.19PM): Really? Words fail me. Q Mathilde looks stunning the contrast gray and purple look very good. Brigitte Macron looks great too.Two classy Ladies. Beautiful look of both of them. 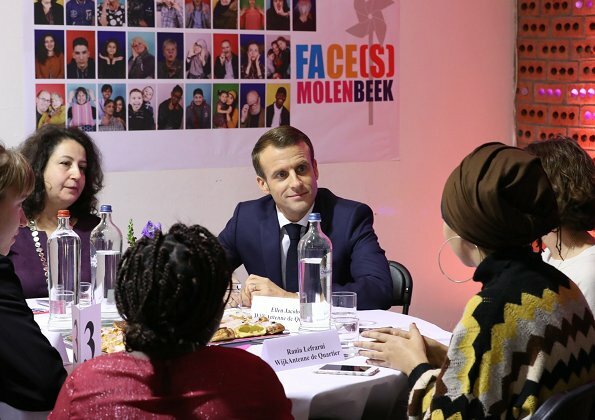 En de Koning en meneer de president en mevrouw Macron, voor alle drie: chapeau! Even though both ladies are dressed completely different, I think they both look good in their choice of outfits. Mathilde is as regal as they come. Not just the choice of outfits, her demeneure and presence oozes elegance and class. Hats off. omg, the outfit of Mathilde is fantastic! Yes, absolutely nice to look at him! Both ladies are elegant and easy going with each other. This outfit of Mathilde is more flattering th a n the red outfit the previous day.